The son of Chinese parents, Sin Thé was born in Bandung, Indonesia. He began his martial arts training under a sand burn master at the age of 6. When he was 7 years old he began studying under one of Grandmaster Ie’s top students. After proving himself worthy, he then studied under Grandmaster Ie Chang Ming as a private student until Ie Chang Ming retired and passed the title of Grandmaster to Sin Kwang Thé (at the age of 25). The Shaolin schools under the Shaolin GrandmasterSin Kwang Thé trace their lineage back to the Fukien temple through a succession of three remarkable Shaolin Grandmasters. The first of the three Grandmasters was born in Fukien in 1849. 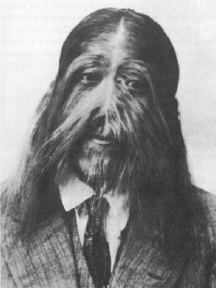 He came to the world covered with hair from head to toe. His horrified parents, convinced that they had given birth to a demon, abandoned the infant in a forest near the Fukien Temple. A passing monk rescued the newborn and presented him to the Shaolin Masters. The Masters realized that it would be nearly impossible to find a family willing to adopt such a child, so they decided to raise him themselves. They named him Su Kong T’ai Djin. From childhood on, Su Kong T’ai Djin studied the Shaolin art with exceptional dedication. The Fukien Masters responded to his enthusiasm with a rare variance from Shaolin tradition. 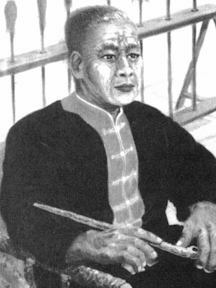 Instead of assigningSu Kong‘s training to a single Master, as was the practice, each of the Fukien Masters contributed to Su Kong‘s martial education. Su Kong was therefore able to complete every branch of Shaolin training, learning and mastering hundreds of forms and disciplines. It was an unparalleled achievement. [Usually the 10 Grandmasters of the temple each learned 1/10th of the Shaolin art]. The Fukien Shaolin monks took it upon themselves to protect the Fukienese coast from the raids of Japanese pirates. They were tremendously effective, earning the love and respect of the common people. When word reached the Ch’ing Kwang Hsu Emperor in Peking, at the beginning of the 20th century, trouble brewed. Kwang Hsu saw the Fukien monks as potential rebels with widespread popular support. He secretly dispatched imperial troops, armed with cannons on a mission to destroy the Fukien Temple. He even sent a renegade Shaolin Master, Chi Tao Su, the White Eyebrow Monk, to strengthen the attacking force. Grandmaster Ie‘s extensive knowledge, sensitivity, and martial skill was complemented by great personal strength and concentration. For example, he trained wearing a weight vest (equal to his body weight! ), and used an iron staff and Kwan Tao. He also did the Iron Bar posture (stretched out between two wooden benches, with his head on one bench and heels on the other) for 2 hours every night. A price was put on Ie Chang Ming‘s head. He escaped to Indonesia, settling in Bandung, where he eventually established a Shaolin school. It was not easy to become his student; there was a long waiting list and each prospective student had to prove his/her worthiness. After 6 months, the sand burn man stopped teaching. Sin Kwang heard about Grandmaster Ie‘s school and went to watch. Grandmaster Ie had 80 students practicing empty hand forms, weapons forms and sparring. The 7 year old Sin Kwang asked to join the school, but he was put off with polite excuses. One evening, Grandmaster Ie spilled a bowl of uncooked rice on the training hall floor. He asked Sin Kwang to pick up the rice, grain by grain, and to blow the dust of each grain. He was to find all of the 855 grains that had been in the bowl. It was late at night, and the Shaolin students had all gone home, by the time Sin Kwang was through dusting and counting the rice. In the beginning, Grandmaster Ie had Sin Kwang do hundred of squats to build up his legs. They were done standing on the edge of a chair, with only the balls of his feet touching the seat. He also had Sin Kwang stand in horse stances for what seemed like an eternity. Next came mastering all 49 postures of the I Ching Ching. Only after these preliminaries were completed did training in martial techniques begin. In 1964, Master Sin was preparing to go to Germany to study engineering and physics. He had added German to the multitude of languages that he could speak. Yet the Berlin crisis altered his plans. By chance, however, he met a couple from Lexington, Kentucky who were able to arrange a scholarship in the US for him. Master Sin Kwang Thé came to the United States. First of all, Master Sin had to learn to move like a snake. Grandmaster Ie tied Master Sin‘s wrists to his feet in an arched position similar to the I Chin Ching #35 posture. In this position, he learned to crawl by moving the muscles of his chest alone. Grandmaster Ie also threw Master Sin into the ocean with his hands and feet tied. Master Sin learned to swim by wriggling his body. Only now was he ready to learn the Golden Snake forms. In 1968 Master Sin‘s training was complete.Grandmaster Ie awarded him the 10th Degree and the Grandmaster’s Red Belt. Sin Kwang Théhad become the youngest Grandmaster in the history of the Shaolin art. Grandmaster Thé continued his education and was on the verge of completing his Master’s Degree when Ie Chang Ming died at the age of 96. 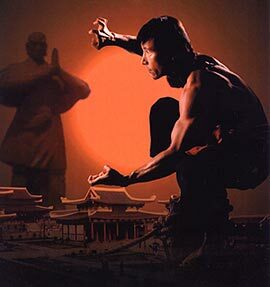 Grandmaster Thé realized that while there were many engineers and scientists, he was the only Shaolin Grandmaster. He dropped his studies in order to devote all his time to teaching the Shaolin art.